Disclosure: I received a product to review. All opinions stated are genuine and my own. What Did the Fox Say??? You've probably heard that song...some of you multiple times, for sure. We were in the video rental store the other day and my 7-yr. old burst out singing it. I just looked at him and shook my head. I didn't even know he knew that song. Evidently he heard it from an older sibling. So... when a package from Cuddle Barn arrived on our doorstep yesterday and it played that song, to say my son was delighted would be an understatement. The musical plush animals at Cuddle Barn are meant to go on display. They are the push-a-button and hear-the-song kind of toy. They are built very well, with a quality that is going to last year after year, and they're cute. People who walk in the room gravitate right towards them. He's got a cute little hoodie that acutally fits on his head. The detail on the Cuddle Barn characters is nice. 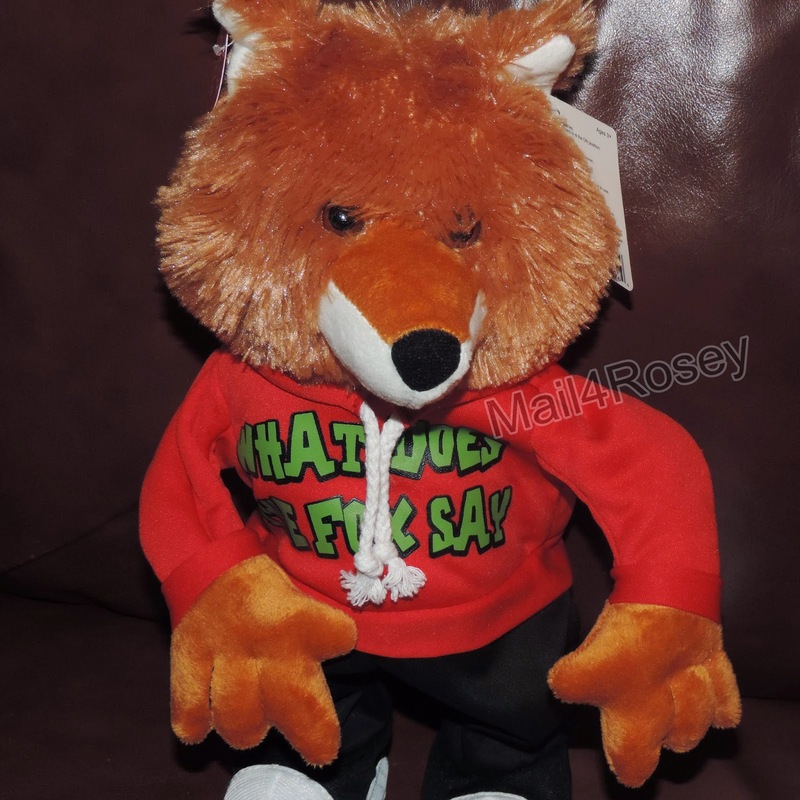 The sweatshirt has a hood that actually fits The Fox, the cuffs are rolled, and there is a screen print on the front that says the name of the song he plays. 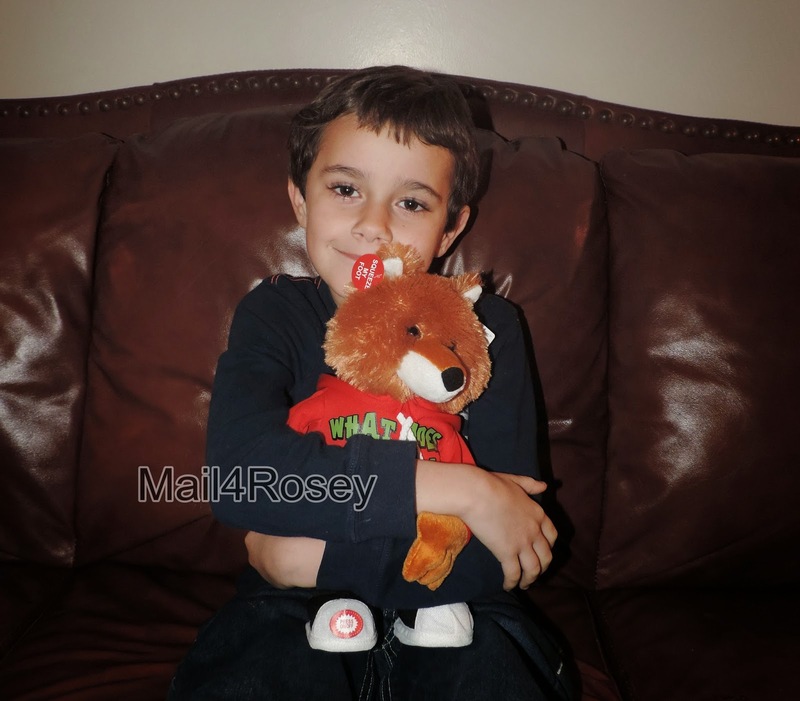 If you have been to my blog before, you might already know my 7-yr.-old still loves, loves, loves his plush animals. Suffice it to say, he and The Fox became very fast friends. Cuddle Barn offers free shipping on all orders within the continental USA. Head on over to Cuddle Barn and check out the large variety of animals they have for sale. You can see the product selection here. You can also follow them on Facebook and/or Twitter. One lucky winner gets "The Fox" to call their own. US entrants only. The picture of the two new buddies together is priceless, your little guy is a cutie... and you can tell he really loves this guy! My youngest is SO into stuffed animals right now. He would love that fox. I just love foxes!!! That's such a cute one too! Aw! So adorable! Cuddle barn is the best, I am always browsing what they have. My girls love foxes, I bet they'd love this. That fox is really cute. My son is 18 and still has all his stuffed animals at the foot of his bed. Mariah LOVES foxes. Every time I see one I burst out singing that song too ;) We ended up buying her a plush fox that sings and dances to this song too. They only had one at Meijer and I suspect Allison might get a wee bit jealous. If so, we are going to have to get one of these cute little guys to make her happy too. I'm having a last song syndrome now. They look adorable together! The fox is so adorable!! It's a great giveaway for kids! This is such a cute fox. My sons girlfriend loves foxes. I got her a pair of Fox slippers. I wonder how much work actually went into the making of that song. Now they're probably millionaires. Bah. I know it's the stupidest song every but for some reason I crack up everytime I hear it. Now it is stuck in my head for the rest of the day. I would love to have this if only to drive the hubby crazy! I love the scrappy one! I love the pink flamingo. I really like Flappy Birthday, too! So cute! Aww he is so cute. Thanks for the giveaway. My kids would love this. I like Patches the Pup. I love the cute stuffed toys that Cuddle Barn has, hard to pick one. What a cute toy! My kids love that song and would love that Fox. I know my kids would love this but I have a girl friend who is obsessed with all things foxes and would LOVE this! I want one of those. That would be a good Christmas gift. Your son is so cute. OH he is cute! And the Beaver looks fun too! The fox says he's cute! Kids always love things they can cuddle. Ah so cute, looks nice and cuddly! Your little one seems to be enjoying it! Ok, he's adorable. Both of them! :) Haha what a fun cuddly toy! I'm not sure who is more adorable the teddy or the boy. My 7 year old daughter would say mom I want one. I kinda one one for myself too. I learned they have a couple of Foxes....we like Foxes at our house LOL! We love stuffed animals in our house. This looks so cute! That is definitely one of the cutest foxes I've seen. No wonder he's so loved. I would cuddle him too! My daughter is very into her stuffed animals right now and I know she would love Elvis Teddie B! courtafi2138 at gmail dot com. OMG this is super adorable - makes me want to cuddle with it too! Your little dude looks like he loves his new toy. That's a great picture. I love the fox itself but I am not sure this Mom would enjoy that song!! LOL. We have a version of the song that is what did the dad say and we sing it at our house when dad is about to say NO. Scrappy is SUPER cute my son would love him! What a great stuffed fox. I love that his outfit makes him seem trendy and cool. Those cuddle animals are so cute! My son who's 10 still loves his plush animals too! He is adorable, but the fact that he is musical is a guaranteed hit for our little ones. Party time when he comes over! Oh boy I remember this commercial haha He's so cute! This is so cute. I've seen this commercial too and I love plush figures. Such a cute toy! Makes me wanna be a kid again! Patches the pup is also cute. OMG the little beaver in the hoodie and hat is adorable! I like the cuddles the cub....too cute. I like the Patches the Pup Nite Brite Pal. I love that it plays Brahm's Lullaby. Oh they are all so cute! I love Icicle Penguin! I like Cuddles the Cub. I like the Cuddle Barn "Elliot Elephant"
I like the 'Rock & Roll Rider' reindeer. Thanks. I like the Cuddles the Cub. Gallop - Musical Horse by Cuddle Barn. I would love to get Patches the Pup. I also like Elliot Elephant, it would make a great gift! My daughter had her dance recital to this song last year so she would love this! I tried to visit the site, but it was down for maintenance. But, the fox would be a great gift for a friend. Hmmm... site says it is down so I can't see what else they have to offer. I'll try later. I learned the Cuddle Barn site was down for the holidays so I didn't get a chance to look at it. The site is down, so there is nothing to look at. I have bookmarked it though! The site is down but I will certainly come back and look around. This looks adorable. I learned they have over 30 years experience. i really like Elliot the elephant.super cute !! My little one collects cats so she would love Lil Bub. I have been a fan of the Cuddle Barn for 2yrs now and absolutely love all their products but come the Holidays they have even more awesome stuffies that sing! My kids would also love their Scrappy, these are too cute! I liked Fred and Astelle dancing to "Mambo No.5"
I love Chef Luigi. He's a cutie! I want Chef Luigi. I love his Look. He looks like he could be a leader. I like the My First Singin' Teddy. I love Paddy the frog. Adorable!!! I know that my little girl would absolutely love all of them, but especially Scrappy! I also like Cuddles the Cub! I also like their Gallop plush horse from their Cute & Sweet section! OMG I LOVE Lil Bub! The Kiss Me Cutie frog is adorable and would be perfect for Valentine's Day! I love Ellie the elephant! I love Kiss me cutie frog, so cute! I like that they have a romance section .